Mucus is one of your body’s first lines of defense against invaders. It traps particles, dust, debris, and a whole host of other “goodies” before they can make your way into the body and cause problems. Unfortunately this process also results in a runny nose, technically called “rhinorrhea”. Your nose produces up to two quarts of mucus each day. In a normal day, the mucus drips down to the back of your throat, where it mixes with saliva and is swallowed without you noticing. In cases where mucus production exceeds this disposal mechanism, the excess can instead flow out the nostrils in what we typically identify as a runny nose. Infection: If something has infected the nasal passage, such as a flu or cold virus, mucus production is increased to prevent the infection from spreading to other parts of the body. Allergies: An allergy is a form of hyperactive immune reaction. Inhaling an allergen will trigger inflammation and heighten mucus production as a defense, similar to an infectious response. Runny noses triggered by things like perfume or cologne operate on a similar principle: there is an irritant and your body doesn’t like it. Crying: You have probably noticed that crying makes your nose run. This is because the eyes and nose are linked through the nasolacrimal duct. In cases of excess tear production, the fluid will drain into the nose. This is why a runny nose when crying will often flow more. Environment: One of the other roles mucus plays is that it’s supposed to warm the air you inhale so it matches your body temperature. When in a dry environment, such as the cold, the nasal cavity dries up and mucus production has to be increased to compensate. You get a runny nose because your body prefers the “better to have and not need” approach. Deviated septum: The wall between your nostrils is called the septum. A deviated septum is when this wall isn’t centered properly and one nasal passage ends up smaller than the other. As a result, it’s easier for mucus to build up and run in the smaller passage. Most people have a deviated septum but only extreme cases cause any noticeable effects—usually as a result of injury. Injury: As mentioned above, a blow to the face can cause a deviated septum. However, this is not the only way injuries can cause a runny nose. Certain forms of skull fracture can cause cerebral fluid to drain into the nasal passage. This is considered a medical emergency and can be potentially fatal. If you get a clear or blood-tinged runny nose and have recently suffered head trauma, seek medical attention immediately. Other: Anything that swells, obstructs, or irritates the nasal passage can trigger excessive mucus production. This can include nasal polyps, tumors, snorting drugs, sneezing, coughing, picking your nose, or pregnancy. A runny nose will usually last until whatever is provoking the mucus membranes goes away. Depending on the cause, this can mean that a runny nose can last for a few minutes or even for a few days. Ways to Fight Back Against Runny, Drippy, Stuffy Noses! Blowing: Blowing your nose can expel trapped bacteria and clear out excess mucus. Don’t do it too often or you’ll end up irritating the nasal passage even more. Steam: Steam helps clear mucus plugs and hydrates the nose. Whether from a hot shower, bowl of soup, tea, or coffee, steam can be beneficial. Be sure to inhale deeply. Humidifiers: These devices add moisture to the air and help keep the nose from drying out. Try not to overuse one, though, since too much moisture can also cause issues. Elevation: Keeping your head elevated when resting helps promote mucus drainage. Salt water: Salt water or saline solutions will thin mucus and make it easier to drain your nostrils. If mixing your own solution, use one-half teaspoon of salt per two cups of distilled warm water. Use a dropper to deliver a few drops to each nostril while your head is tilted back. Inhale gently and then blow your nose. Repeat until you feel relief. Over-the-counter medicine: Over-the-counter solutions for runny noses include vapor rubs, allergy medication and decongestants. Hydration: Staying hydrated will make your mucus more watery and easier to drain. Diet: Inflammation will narrow the nasal passage and make it harder for food to drain. Eating foods with known anti-inflammatory effects like garlic, turmeric, or mustard oil may help. Spicy food: Spicy food is known for giving you a runny nose, so its inclusion here may seem odd. In cases of congestion, a mucus plug makes it harder for mucus to drain. Spicy food will help liquidate the plug and promote drainage, but should be avoided in other instances. 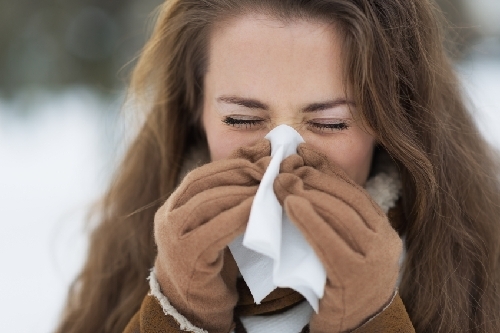 Keeping clear: Avoiding further irritants is important when trying to treat a runny nose. Avoid tobacco smoke, perfumes, cologne, dusty air, and other sources of irritation when possible. The symptoms last for more than 10 days. You have had a high fever for more than three days. The mucus is green and comes with sinus pain or fever. You have asthma, emphysema, or are immune-suppressed. If there is clear or bloody discharge after a head injury, seek emergency medical help at once. In children under two-months-old, a runny nose should always be paid attention to. Have a doctor examine your child if the runny nose is accompanied by a fever or if congestion makes nursing or breathing difficult. “Runny Nose,” Mayo Clinic web site, March 27, 2013; http://www.mayoclinic.org/symptoms/runny-nose/basics/definition/sym-20050640. Spares, K.,”How to Get Rid of a Runny Nose? (Fast and Overnight),” Lethow web site, May 17, 2014; http://lethow.com/health/get-rid-of-a-runny-nose-fast/.